JACKSON L. JENKINS. On the opposite page is presented a portrait of this gentleman, who is a prominent farmer of Rural Township, residing on section 14, and his residence in Shelby County dates from April, 1856. He was born in Delaware County, Ohio, June 30, 1825. His parents were Jonathan W. and Rebecca (Rosecranz) Jenkins, natives of Pennsylvania. His father, Jonathan Jenkins, went to Ohio in 1816. He there married, and in 1835 removed with his wife to Ogie County, and settled upon a farm, being one of the early pioneers in that part of the state. Rebecca Jenkins was the mother of ten children, eight of whom lived to be grown, and of these our subject is the eldest. The father of our subject married a second time Mrs. Mulkins becoming his wife. He still resides at Oregon, this State, and has attained a good old age, his natal day having been January 27, 1802. Our subject was but a boy when the family removed to Ogle County, and at that date there were at least ten Indians to every white man. Here our subject grew to manhood, and had a personal acquaintance with every man in Ogle County. He carried the first mail that was sent between Dixon and Oregon, and the first mail bag that he ever saw was one that he got at Dixon. He later extended his mail route from Oregon to Buffalo Grove. At that time the mail was carried on horseback. He also carried the first mail pouches that were conveyed by wagons between Oregon and Rockford. He was thus employed about four years. Our subject's father resided in town, but as he owned a farm near the village, young Jenkins tilled the soil. In 1836 his father built the first cabin in Oregon, having passed the winter of 1835-36 at Dixon. In 1856 our subject came to Shelby County, having previously purchased eighty acres of land, for which he paid $100. This he improved and sold, and since then his residence has been in Rural Township. The lumber for the first house which he built in Ogle County, our subject hauled from Chicago, a distance of one hundred miles, but when the dwelling was erected, its magnificence outshone anything in the county. He now owns two hundred and sixty acres of land in Rural Township. Mr. Jenkins has been twice married, July 7, 1850, he was united to Harriet L. Van Loon, who was a native of Delaware County, Ohio. She removed with her parents, Mathias and Elizabeth Van Loon to Ogle County, at an early age. She died in Shelby County in 1861, being only thirty-four years old at the time of her death. She left four children — Rebecca, John, William and George R. The eldest daughter is now the wife of V. J. Sevier and resides in Missouri. John and George make their homes in Rural Township, while William resides in Ridge Township. In 1863 our subject married Mrs. Sarah A. Travers nee Downs. She was a daughter of Daniel and Mary E. Downs, and married Alex Travers in 1856. He died in 1862, leaving four children, all of whom passed away under twelve years of age. Mr. and Mrs. Jenkins have had eight children, seven of whom are living. They are Alice, who is the wife of Arthur Engle; Frank; Emma, who married William Mose; Chester, Effa, Edith and Lloyd. Our subject and his wife are members in good standing of the Christian Church. Although in his political inclination Mr. Jenkins was formerly a Democrat, of late he has transferred his allegiance to the Farmers' Mutual Benefit Association. He is a man who is greatly interested in all progressive movements, the subject of education being one which is nearest and most important to him, for in it he realizes the influence that is strongest for good in our country. He has held the position of School Director for thirty years, and has been a Road Commissioner for fifteen years. 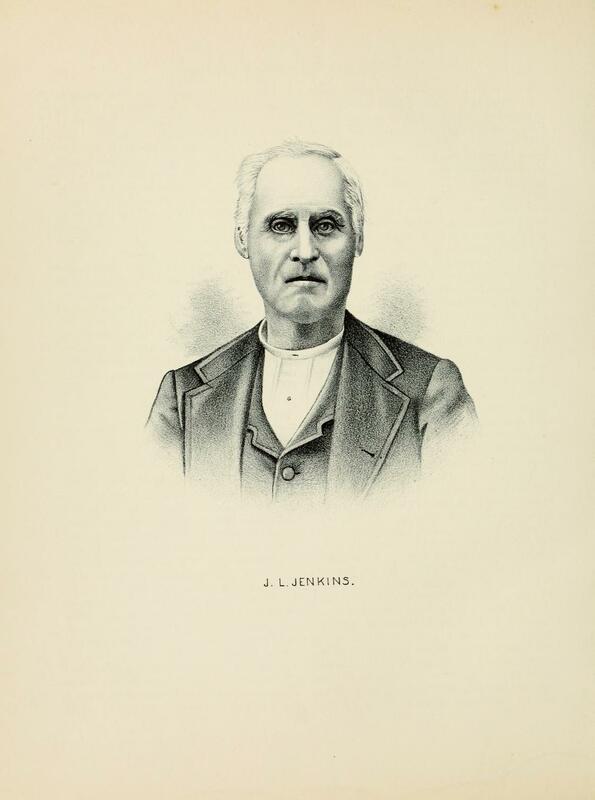 Of a kindly and genial temperament, Mr. Jenkins is beloved by all his fellow-townsmen, and having seen so many changes through which the country has passed since the days when he carried the mail over the prairie on horseback, he is a fertile source of information to those who are interested in the history and advancement of their State. Extracted 11 Jan 2018 by Norma Hass from 1891 Portrait and Biographical Record of Shelby and Moultrie Counties Illinois, pages 306-308.